Cheetah spots and turquoise on this double stacker bow. Both layers have grosgrain ribbon, 2.25" white on bottom and 1.5" tan with blue spots on top. 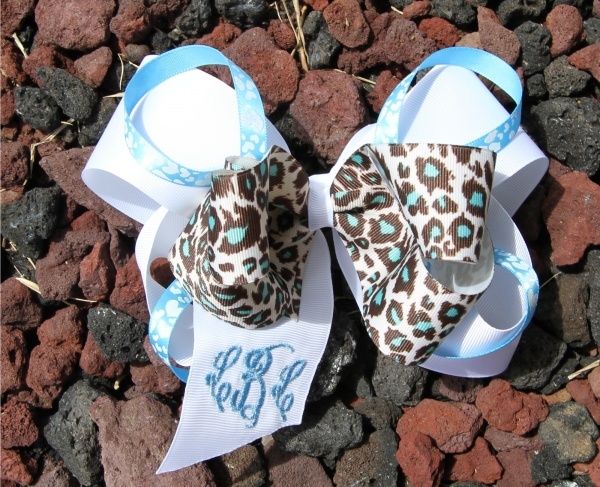 There are four satin 3/8" ribbons that are light blue with white hearts to decorate each loop on the bottom bow. This picture shows the added feature of a monogram in the curly French monogram font. Add the embroidery and state the letters and color of thread you prefer.